This morning I reported that Cameron Wilson — son of 1975 Staples High School grad Dave Wilson — earned a coveted spot at the US Open golf tournament, this weekend on Long Island. Then I posted a story on Rebecca Russo, who showed off her National Women’s Hockey League Isobal Cup yesterday at Saugatuck Elementary and Bedford Middle Schools. 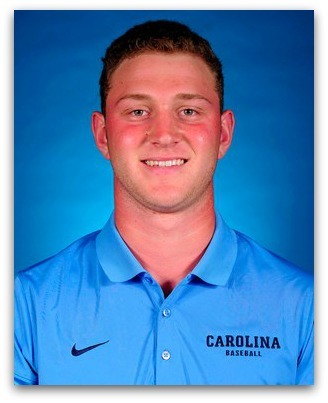 And right now on ESPN you can watch Ben Casparius try to help the University of North Carolina win the College World Series. The Tar Heels are playing Oregon State University in the first game of the double-elimination event in Omaha. Casparius was a 4-year star for Staples, leading the Wreckers to the 2017 state championship. He was Connecticut’s Gatorade Player of the Year, among other honors, and graduated as the state’s all-time hits leader. Though just a freshman, he’s in the lineup as UNC’s designated hitter. Meanwhile, if you’re in Russia for the World Cup, please send us a report. We want to cover all the bases. This entry was posted in Categories and tagged Ben Casparius, College World Series, Staples High School baseball, University of North Carolina baseball. Bookmark the permalink. It is on ESPN (not CBS). Ben has an RBI in his first at bat in 5 weeks – has been injured. Thanks – I’ve just changed the story to note it’s on CBS. My apologies. Ben ended up going 2-5 with 3 RBIs– half of the teams 6 earned runs, en route to an 8-6 NC win. Quite impressive. Congratulations to Ben! Very exciting to see him play at the next level. The Arciola’s are cheering for you all the way!!!! !